Boasting more than 200 acres of leafy countryside, Blackheath, an affluent suburb of London, is a largely residential area lined with awe-inspiring Georgian and Victorian homes, many converted to Blackheath flats. This wealthy green area of London is composed of a community atmosphere within a well-kept family village. Blackheath flats are close to a plethora of private education and successful state schooling facilities that make it attractive to families with young and older children. Also residing around this area are the likes of professionals and young couples who are aspiring to start families due the local amenities and the prime transportation links to London and the A2. Ranging from luxurious one or two bedroom Blackheath flats to a six bedroom Victorian house, the Blackheath flats and the general Blackheath rentals market has something for everyone. While the price tag on these addresses may be high, you’ll certainly be pleased with what you pay for in this quaint, safe district. The suburb displays a selective assortment of neighborhood businesses and commercial shops. Restaurants, bars, gastro pubs, boutiques, and florists are all conveniently within a moment’s reach of each other. Want to know more about Blackheath rentals? Blackheath’s main shopping streets include Montpelier Vale, Old Dover Street, and Tranquil Vale. These streets all offer a prize selection of independent stores, boutiques and quaint eateries that only embellish its small town and village charm. Blackheath’s farmers market occurs every Sunday and is as much a social gathering as it is an exploration of the senses. Cultivating savory British food and drink with farm milk from Sussex, fresh fish from the east coast and a huge assortment of tasty artisan foods. Fat Face, a clothing store for men, women, and children, is a popular retail chain located in Blackheath. With a wide selection of garments, you’re sure to find what you were searching for at Fat Face, and with a decent price tag to boot. They identify as selling “lifestyle” type clothing, more for the twenty-something age range consumer. Sisters & Daughters is a delightful little shop catering to the likes of the young moms, and the commuters crowd; selling mostly jewelry, trendy women’s clothing, children clothing, gifts, and stationary. This shop is a quirky little place to pop into for a cute dress for a night on the town, a precious onesie for your child, or a little gift for a loved one. Sisters & Daughters is located conveniently near Blackheath Station and a range of eateries, pubs, and other quaint local shops. 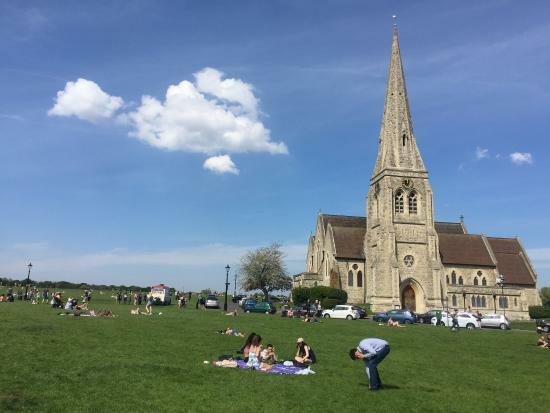 Blackheath is home to many independent restaurants, with cuisine styles ranging from French, Indian, European, Italian, to traditional English, whatever you are craving, Blackheath is sure to have it. Enjoy French cuisine as it should be at Cote Brasserie, serving breakfast, lunch, and dinner. Offering a refreshing take on mouth-watering favorites with fresh ingredients delivered direct from Paris for true authenticity, this establishment is a friendly well-priced place to dine if you’re in the mood for some bona fide French fare. Hand Made Food is another one of Blackheath’s well known trendy spots, made fashionable by the loyal locals who enjoy the uncommon combination of flavors created by the restaurant’s seasoned chefs. From beetroot infused couscous to curry mutton, you’ll surely be finding yourself returning for some more unorthodox plates. Zerodegrees, an Italian eatery, is possibly the most prevalent amongst the Blackheath residents. A laid-back place to grab a brew and a slice of pizza, Zerodegrees is a low key restaurant to come and kick back and have a delightful bite to eat and a few pints with friends. Brewing their own beer, this establishment is not just for a meal, but if you’re out on the town for the night, this restaurant turns into a microbrewery pub at night. The Blackheath Common is a wide expanse of stunning greenery, where it is locally loved for the sunset views. A trendy place amongst kite fliers, picnickers, and footballers, this is a great area to expend some energy on a lazy afternoon. It is not unusual to see a football tournament to be taking place on the grassy fields on a sunny day here. With firework shows during the winter, and a circus being held during the summer, it’s obvious to see why the locals pride themselves on this park. Conveniently, this charming lot is a stone’s throw away from cafes, pubs, and restaurants for when you’re ready to call it a day at the grounds. Southeastern rail services from Blackheath station provide direct commutes to major central locations, including London Bridge, Charing Cross, and London Victoria all within 25 minutes or less. The nearest Underground Station is North Greenwich, offering Jubilee line services.